A relative of T.rex, Appalachiosaurus was the dominant predator in Alabama during the Late Cretaceous Period. The bones on display in this exhibit come from the most complete Appalachiosaurus ever discovered and represent the most complete tyrannosaur ever found in the eastern half of the United States. Unlike T.rex, the arms of Appalachiosaurus were large, perhaps representing the largest arms of any tyrannosaur ever discovered in North America. This skeleton represents the first mountedAppalachiosaurus on exhibit in the world. Nodosaurs were large armored dinosaurs that walked on all four legs. Nodosaurs were slow dinosaurs and likely spent large amounts of time grazing on low-lying vegetation. The backs of these dinosaurs were covered with a series of scutes (also known as armored plating) and bony spikes that helped protect them from any attacking dinosaurs. Dromaeosaurs were lightly built, quick-moving dinosaurs that likely hunted in packs. Dromaeosaur jaws were lined with backward-curving teeth, allowing it to better grasp its prey. This dinosaur also had powerful claws on its fingers and a large curved claw on the second toe on each of its feet. It is likely Dromaeosaurs would have balanced on one foot, allowing the other foot to swing forward, and the claw to cut open its prey. Ornithomimids were fast-running dinosaurs with toothless jaws. They had two hands that were likely used to pull branches with fruit down to feeding height. It is likely Ornithomimids also ate insects as a source of protein. Pteranodon was not a dinosaur but instead is considered a flying reptile. Like modern birds,Pteranodon had light, hollow bones- a trait ideal for flight. Pteranodon could have likely soared for extremely long distances, skimming above the ocean while hunting for fishes. Ichthyornis was a small bird that once lived in central Alabama near the shore of the Late Cretaceous Inland Sea. It is likely that the tern-sized Ichthyornis looked and behaved much like modern sea birds, and spent the majority of it’s time flying over the ocean hunting for small fish. Unlike modern birds, the beak of Ichthyornis was full of small, sharp teeth.The bones of Ichthyornis are so small, light-weight, and fragile, so it is very rare to find more than only isolated bones of this bird. 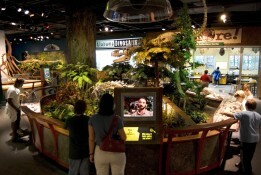 McWane Science Center houses one of the world’s largest collections of Ichthyornis remains.